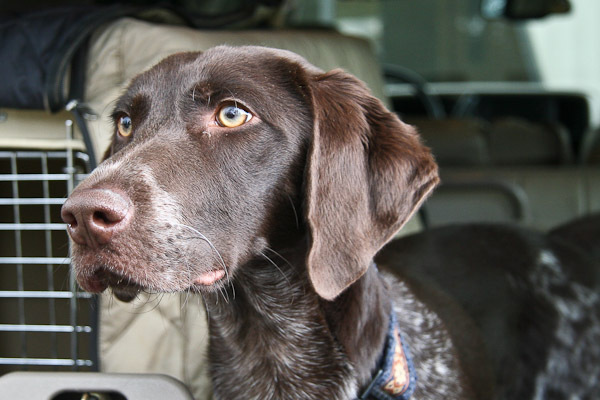 This page is for people who are considering surrendering their German Shorthaired Pointer (GSP). We urge you to reconsider, and to explore all the options available to you before you come to that sad decision. Think through possible options: How about training – even if you didn’t get around to it before, dogs of all ages are able to learn! See our training section for names and contact info of trainers. Maybe your German Shorthaired Pointer just needs more exercise – doggy day care is an option, as is a dog-walker. You might be able to barter services if finances are an issue, or find a high school student who needs community service hours. We are here to help you with advice and support, you are welcome to contact us, and a volunteer will be in touch to assist you. Are you moving and need to find housing that accepts pets? Use one of the many housing search engines, where you can set your search criteria including pet options. Or simply type “pet-friendly housing near me” (or desired town’s name) in the search bar of your device. Our priority for dogs coming into our foster program are those German Shorthaired Pointers in shelters that are in immediate danger of being euthanized. In order to give these dogs a chance, we must limit the number of dogs we take from private homes who are being surrendered because their owners no longer have time for them, are moving, etc. We will accept animals from the public only as a last resort IF space is available in an appropriate foster home. If you are looking for another home for your dog, please refer to the information below. You’ve come to the sad decision to give up a member of your family. Now what? Contact the person you obtained the dog from. Reputable breeders, shelters, and rescue groups will take back dogs that have been adopted from them. See if family or friends will take the dog. Check out these tips from Petfinder on Giving Up Your Pet and Finding Your Pet a Home. Read this article from Best Friends Animal Society on How to Find Homes for Homeless Pets. Screen potential adopters. Meet the entire family and visit their home. Collect a rehoming fee (this discourages people looking for free dogs for fighting or medical research). Don’t post on Craigslist – too often, people are looking for free or inexpensive dogs as bait for dog fights, or worse. We will also post your dog on our social media forums, which typically receive over 10,000 views for GSPs seeking new homes. If your dog is a breed other than a purebred German Shorthaired Pointer, please contact the appropriate breed or all-breed rescue(s) in your area. 1) Upload photos of your GSP, preferably including: face, full body front, full body side. It’s helpful if the dog’s name is in the file name. Upload one at a time. Tips: a few headshots and activities your dog likes, or just lounging around, are nice. Think of them as your dog’s dating profile pictures! We suggest minimal hardware on the dog; a flat collar is acceptable, but please no prong or electronic collars. IMPORTANT: Photos must be included to be considered for assistance with rehoming your dog. If the images do not upload, please email them to us. 2) Complete the rehoming questionnaire. If you have trouble with the form or image upload, contact us and we’ll do our best to assist you. Potential adopters would contact you directly and you would be responsible for screening them (look at our adoption questionnaire for screening question ideas). We recommend that you meet the whole family, do a home visit, and collect a rehoming fee. We keep your listing posted until the dog gets adopted or you tell us to take it down. Since our priority is shelter dogs in danger of being euthanized, it is not likely that we will be able to bring your dog physically into our rescue program. If for any reason you do take your GSP to a shelter, please send a brief e-mail to us letting us know where you took the dog. Also visit No Paws Left Behind to find a no-kill shelter. Not in Northern California? Contact the GSP rescue group for your area, which you can find at National GSP Rescue. If you must take your dog to a shelter, you can give your dog a GREATLY, HUGELY, IMMENSELY, TREMENDOUSLY better chance at being adopted if s/he is spayed/neutered. Why? Many shelters do not place unaltered dogs up for adoption because they just don’t have room. Most shelters don’t have spay/neuter clinics, so in order to alter the dog, they need to pay for the service at a vet. This is often more than the shelter fee to adopt a dog. Since shelters don’t have enough funds to alter all incoming dogs, they choose the ones that will be easiest to place. GSPs are not easy to place. If a shelter does have a spay/neuter clinic, space is at a premium in the adoptable area for shelter dogs being altered before going to their new home, so incoming dogs that are already altered have a higher priority getting a spot in the adoptable area. Shelters with vet staff (but not spay/neuter clinics) do not have the equipment or space to handle dogs over 50 pounds, so adult GSPs left there would not be eligible for spay/neuter which then puts them at a lower priority than the smaller or already altered dogs. Read more here for tips if you are facing home foreclosure. Never leave pets behind when you vacate your home.